Depicts the extensive rail network in New Jerseym including the Camden and Amboy - one of the ten oldest railroads in North America. 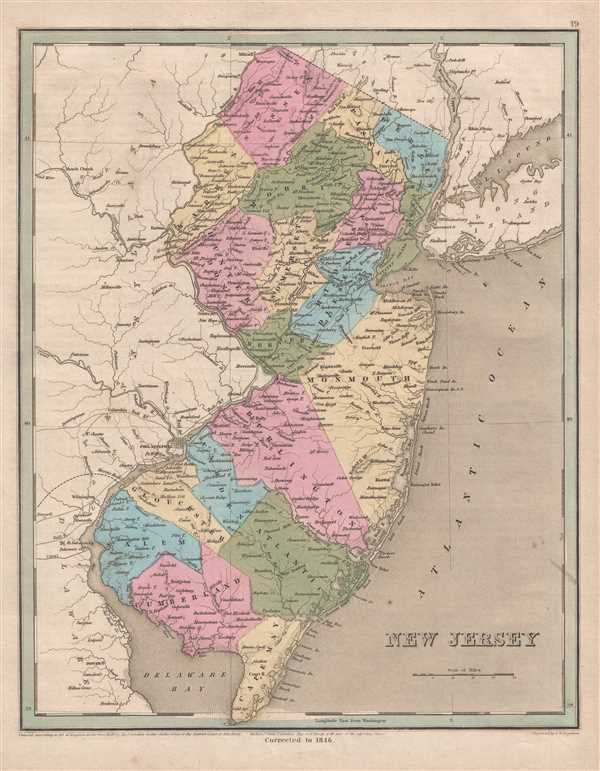 This is an 1846 Thomas G. Bradford map of New Jersey. The map depicts the region from Pennsylvania to Long Island and Connecticut and from Pennsylvania and New York to Delaware, Delaware Bay, and the Atlantic Ocean. As is the case among many maps from Bradford's A Universal Illustrated Atlas, the extensive railroad network in New Jersey is featured. Several different railroads are illustrated, including the Camden and Amboy, the New Jersey Rail Road, and the Central Railroad of New Jersey. The Camden and Amboy was chartered on February 4, 1830, making it one of the ten earliest permanent North American railroads. The Camden and Amboy ran south from New York Harbor at South Amboy to Camden, where it provided a connection to a ferry on the Delaware River to Philadelphia. The New Jersey Rail Road and Transportation Company (NJRR) was chartered on March 7, 1832 and planned as a parallel route to the Camden and Amboy. Connecting Jersey City to Trenton, the NJRR provided the same service as the Camden and Amboy, except the journey by ferry to Jersey City from New York City was shorter than the crossing the South Amboy. The NJRR, which eventually ran through New Brunswick, slowly began consolidating ownership of the region's bridges and turnpikes, and by 1846 held a fairly strong monopoly on bridges over the Passaic, Hackensack, and Raritan Rivers. The Central Railroad of New Jersey, was originally chartered as the Elizabethtown and Somerville Railroad on February 9, 1831. The completion of new lines connected it with the New Jersey Rail Road and the Somerville and Easton Railroad. The Elizabethtown and Somerville bought the Somerville and Easton in 1849 to become the Central Railroad of New Jersey. Today, all of these lines are part of the NJ TRANSIT network, the PATH network, Amtrak, or Conrail. Highly detailed, each county is illustrated, labeled, and shaded a different color to allow for easy differentiation. Numerous cities and towns are labeled, including Jersey City, Hoboken, New Brunswick, Princeton, Elizabethtown, Trenton, and Camden. Outside New Jersey, the cities of New York, Brooklyn, Williamsburg, and Flatbush are labeled in New York, Philadelphia is labeled in Pennsylvania, and Dover is labeled in Delaware. Myriad rivers and lakes are depicted and labeled throughout the state, including the Delaware River, along with Delaware Bay, Rariton Bay, and New York Bay. The coast of New Jersey is depicted in detail and Cape May is labeled. Very good. Even overall toning. Light soiling. Blank on verso.